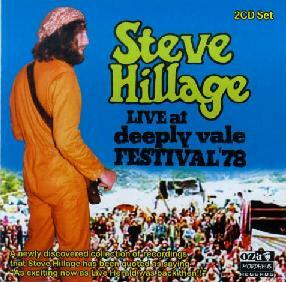 Steve Hillage - "Live At Deeply Vale Festival ' 78"
About as good, if not perhaps better than his other live releases,'Live Herald' and 'BBC Radio 1'. A very decent soundboard source recording. This concert has apparently been bootlegged before, so this official/legit release is most welcome by all fans and collectors. All of disc one (63:21), which are a total of nine tracks, and the first four cuts on disc two give the fan a complete length 77-minute Hillage gig that should be a delight to experience for most fans. A few spots during the last couple of songs do reveal several rough moments, but it doesn't deter from the overall quality of the show. At least I didn't think so. Just do what I do, think of this 2-CD pressing as a band-released title that their recording equipment had a few problems while taping the festival's events. Songs I was most impressed with were "Searching For The Spark", "Octave Doctors", "Palm Trees", his Donovan cover "Hurdy Gurdy Man", the truly cosmic "Lunar Musick Suite", "Activation Meditation" and the Gong classic "Glorious OM Riff". Disc two (67:31) later progresses into some assorted cuts that come from various audience cassette tapes. A few decent snippets of Tractor playing some live material from Deeply Vale. One in particular, their tune "Argument For One", comes from a decent sounding audience recording that actually could be released along with the entire set for a future release. Very nicely done. Line-up: Hillage-guitar, vocals & keyboards, Miquette Giraudy-synthesizer & vocals, Christian Boule-glissando guitar, John Mackenzie-bass & vocals and Andy Anderson-drums. Comes with 2 eight-page fold outs that feature plenty of photos and informative liner notes. A must-have for any and all fans of Hillage, Gong, Avant Garde, Canterbury and British psych. For more information you can visit the Ozit web site at: http://www.geocities.com/uheep2.